During the late Victorian era, Lakeville, blessed with a number of large and pristine freshwater lakes, began to develop as a summer resort of fashion for middle and upper class tourists. Many summer residents were drawn from commercial, professional and political circles in local cities such as Brockton, Taunton and New Bedford. The turn-of-the-century Lakeville summer colony ultimately came to include such regionally prominent individuals as Scottish-born Colonel James Edgar of Brockton, owner of the Boston Store in that city where he had introduced the first department store Santa, who resided at “The Craige” at Sampson’s Grove; Edgar’s son-in-law William L. Wright of Brockton also at Sampson’s Grove; bankers A. C. Place of Taunton and C. R. Fillebrown of Brockton, both at Nelson’s Grove; Edward Parker, principal of Brockton High School; Arthur E. Perry of New Bedford who owned the Sampson Tavern (known as Elmhurst at the time) and who was a law partner of former Attorney General Hosea M. Knowlton; former New Bedford Mayor Morgan Rotch whose Hilltop Farm on Highland Road overlooked Assawompsett; former Brockton Mayors E. M. Low and E. H. Keith, both situated at Nelson’s Grove; and Frank Barrows, postmaster of the City of Brockton. At the time, the Assawompsett summer colonies in Lakeville were but a recent phenomenon, having developed only following 1878. At that time, John Hiram Nelson of Lakeville pioneered both Nelson’s Grove on the west shore of Assawompsett as a cottage colony and Stony Point as a venue for picnics, clambakes and other activities. By 1905, there were some 150 “cottages” lining the shores of the Lakeville ponds, ranging in quality from truly modest structures of a few rooms to larger rambling homes. Generally, summer residents occupied their homes between late June and early September, although hardier souls frequently remained behind to enjoy the fall fishing and hunting season. The number of cottages in the Assawompsett neighborhood grew rapidly during the twenty years surrounding 1900 when the lake experienced its heyday as a recreational haven for southeastern Massachusetts urbanites of means. By 1910, Long Pond had begun to succeed Lake Assawompsett as a site for the location of summer cottages, a development attributable to the fact that Long Pond fell largely outside the purview of the municipal water departments of the region. By 1912, the recreational development of Assawompsett had peaked, and subsequent energies would be focused nearly exclusively upon the pond to the south. 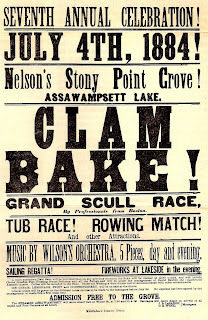 This poster printed by the Middleboro Gazette print office advertised the Independence Day celebrations of 1884 at lake Assawompsett, featuring fireworks, boat races and feature clambake. Beginning in the 1870s, Lake Assawompsett began to develop as a local recreational resort, a process brought to an abrupt end when the lake became a municipal water supply for the city of Taunton. 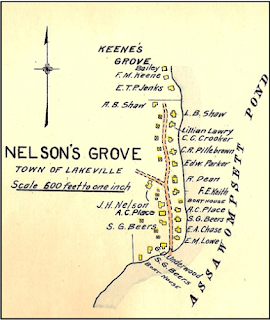 "Nelson's Grove", detail, Atlas of Surveys: Plymouth County and Town of Cohasset, Norfolk County, Mass. (np:L. J. Richards Co., 1903). The map shows the development which had occured at Nelson's Grove following the mid-1870s. Most of the names listed as home owners on the map were Taunton and Brockton men of note.